3 Punts Galeria promotes, distributes and sells contemporary art in all its disciplines. Hardware: tangible physical parts of a computer system is effectively a mission statement of the gallery’s direction. It showcases the sixteen most representative artists they’ve worked with to date or will collaborate further with in the future. With work from Shepard Fairey, Mr. Brainwash, Konair, Alejandro Monge, Gerard Mas, Eine, Okuda San Miguel, Samuel Salcedo and more, the exhibition is an excellent introduction to some of today’s most celebrated visual social commentators. 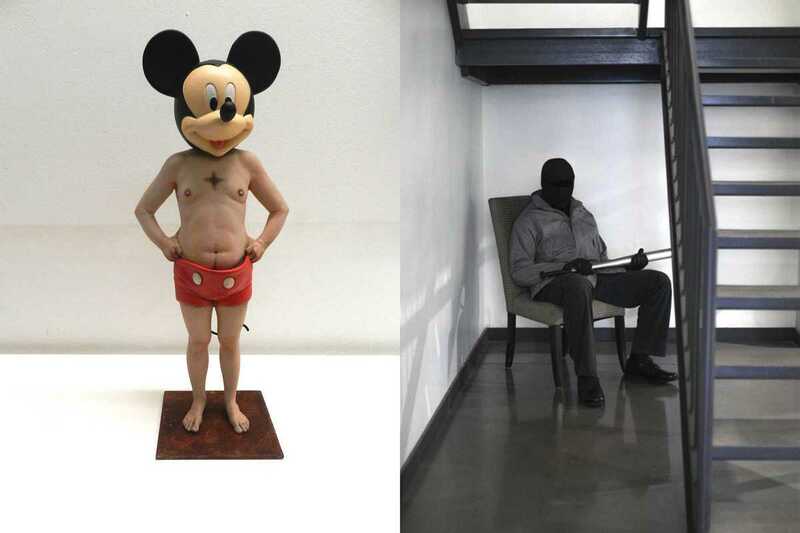 Works of note include Barcelona native Salcedo’s Don Mickey, which consists of a pale, out-of-shape male figure bearing the weight of an oversized Mickey Mouse head on his shoulders. Another is Mark Jenkins’ The Dugout. A menacing centerpiece, it features life-size, hooded mannequins with blacked-out physical features clutching baseball bats.